I realize the title of this post comes out of left field; what does a modern television show about high-tech crime scene investigators have to do with being a better DM? Once you get past the obvious differences, TV shows like CSI can teach us a lot about storytelling that can be used directly in any D&D campaign. I first started watching CSI in its third season. At the time, I was watching very little television, instead spending most of my time playing video games and watching movies. One evening, flipping through channels, I settled on CSI. I had no background knowledge of the characters at all, and no sense of any continuity between episodes. Even without a frame of reference, it was still compelling television. Though limited to 45 minutes in length, this episode of CSI (and most others) had an intriguing beginning, interesting plot developments, and a satisfying conclusion. There were no real loose ends left over, no questions unanswered. It was a bite sized chunk of high quality entertainment. 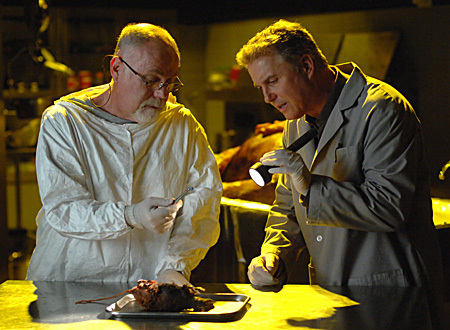 So what can DMs learn from shows like CSI? The CSI model is an excellent paradigm for a D&D campaign, especially one for one run by a new DM. Even though most DMs are highly creative people, there is only so much time in the day. Creating a tightly knit storyline, where every session has a deeper meaning to the overall plot, can be overwhelming. Why not use shorter, standalone adventures instead? Sometimes, a simple story hook, an interesting environment, and a challenging final encounter are enough for a solid D&D experience. These adventures take less time to prepare, since you don’t have to worry about advancing the overall plot, incorporating every NPC you’ve established, or driving the players forward on some grand quest. Spend your time instead making your descriptions, skill challenges, and encounters as polished as possible. An entertaining, well run one-shot is better than a hastily created, plot-heavy adventure any day. Another benefit of running adventures like this is that the focus is on the players instead of the plot. How do the players solve the problems? How do their actions influence the outcome of the adventure? In plot heavy games, the story itself can become more important than the players; this should be avoided. You can have amazing gaming experiences with self contained adventures that don’t advance the overall story at all. Your players will love it when they get immediate payoff for their actions, and you as the DM will find such adventures far easier to prepare for. A typical episode of CSI lasts about 45 minutes, which means that it is carefully edited. The completed episode is lean, pared down to the absolute essentials. Brief montages, particularly when evidence is being gathered, are often used as a time-saving device. We might see glimpses of evidence like bloody footprints, clothing, or matchbook covers flash across the screen for less than a second. Why do the creators spend time showing these things at all, however briefly? To tie it in later, of course. The matchbook might lead to a bar where the murderer is a regular customer, for example. Foreshadowing like this is a common technique in all media. Seemingly insignificant, random items tie together neatly in the end, when the mystery is resolved. How can we use this idea in our campaigns? Drop minor hints about upcoming adventures in your sessions. The gears in your players’ minds start turning, and when these hints pay off down the road, a sense of continuity is established. If the antagonist of your next adventure is a street gang, perhaps the PCs see the gang’s symbol painted in graffiti. Will they be tracking down a manticore terrorizing a mountain pass? An NPC they must interact with in the current session could be recovering from the beast’s attack. You can even look back at prior adventures, tying them in to the present session. Did the PCs defeat a cleric of Orcus a few adventures back? Perhaps a secret acolyte from the same temple attempts to poison their meal at a local tavern. If the group defeated a local band of orcs, a neighboring tribe might attack in retribution as the PCs travel to a nearby dungeon. I followed the adventures found in the Essentials line in my campaign, and used hooks like these in order to (loosely) tie them together. In the early stages of Reavers of Harkenwold, the knight had a dream about a spectral figure, tying in to the Dungeon of the Ghost Tower. During a Nature check, the shaman learned that the weather was unseasonably cool, leading into the Cairn of the Winter King. During the mob scene in that adventure, several important NPCs were introduced, to be called back to remembrance later. In the “frozen minions” room, I placed a mini of the Beholder Eye of Frost, who might take over the dungeon now that the Winter King is dead. The white dragon was defeated, but not necessarily killed, giving me another potential encounter to use later. Though these adventures aren’t tightly knit as far as an overall plot goes, a few connections here and there make them seem more cohesive. CSI first appealed to me because of its self-contained nature. Watching even one episode was enjoyable. I plan to adopt a similar model for my campaign. An epic storyline with a clearly established end goal is fine and dandy, of course; I suppose we all want to create our own Lord of the Rings or Dragonlance saga. But slavishly railroading every single encounter to tie in to your story arc is foolish. You can still have a good sense of continuity by developing great stand alone adventures, or even using published modules, and finding small ways to tie them all together. CSI has been running for over a decade using this formula, so it obviously works. Don’t worry so much about the epic conclusion of your campaign, just make sure that every step on the way is as enjoyable as possible.